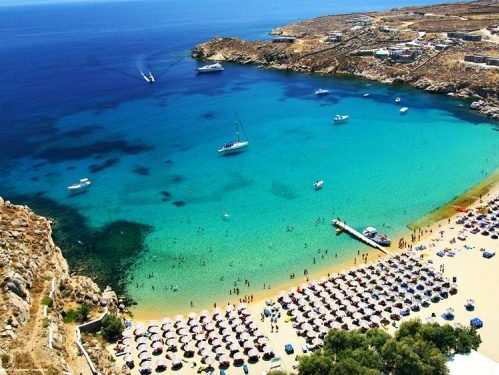 Super Paradise beach is one of the most famous beaches on the island Mykonos. Well known for its all day parties, beginning early in the morning and ending late at night. The parties arising on the beach, they have been the most important pole of attraction for young and those who feel young. After the decade of the’50s, has been established as the top place for VIPS. Many people, amazing clubbing and eccentricity to its greatness. If you see someone next to you who admire, do not be surprised. Mykonos island offer you the beauty of the Greek hospitality. Mykonos is one of the most famous island in Greece. Mykonos is a popular top destination for celebrities all over the world. Famous people choose to buy villas in the island of Mykonos. The Greek beauty is all over the place in the island. There are many beaches where you can discover and feel comfortable. Some of the beaches are full organized and offers you all the comfort you need. Super Paradise is one of the beaches you must visit. This beach is famous for the parties until morning. The dance and the drinks never stops and once time in your life you need to live this experience. Around the beach Super Paradise there are a lot of restaurants with modern cuisine and Greek traditional food in so many taverns. You can enjoy your meal and your coffee in one of the many cafeterias. Do not forget to visit Super Paradise, if you want to live a unique experience with fun to the limits. Distance from Mykonos Town: 6km. Boutique with beachwear, cigarettes, sunscreen etc.